Happy Wednesday! 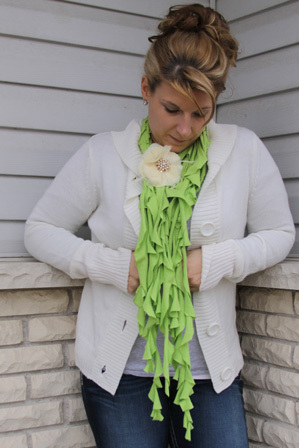 This addition of What I wore Wednesday includes 2 easy outfits as well as an awesomely easy DIY ruffled scarf tutorial. 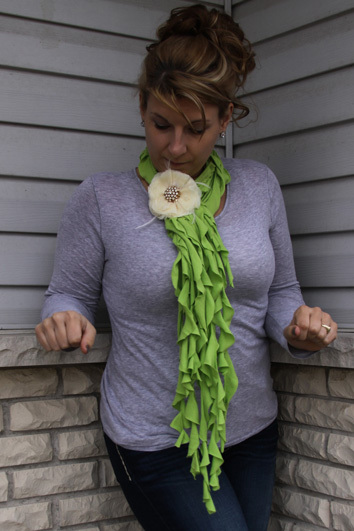 A quick and easy project that leaves you with a fun and feminine scarf for you or anybody on your gift giving list this winter. 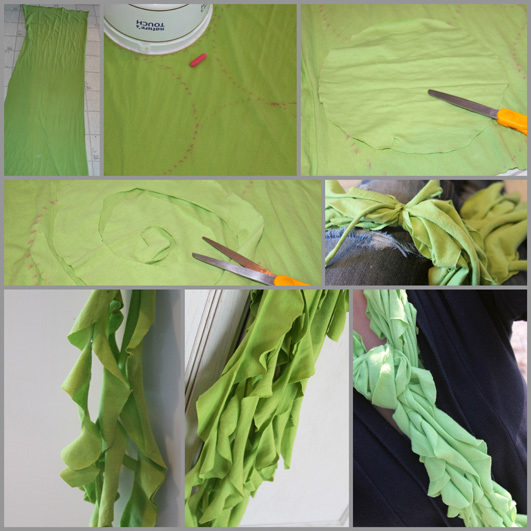 Don’t worry if you don’t sew… all you need to make this great scarf is some fabric (or an old t-shirt) and a pair of scissors. Anybody can make these and I suggest you make a few in several different colors, because you are going to love them. Before we get to the scarf, here is Monday’s outfit for the week. My Pinterest Inspired outfit comes from Vanilla Latte on Polyvore. This comfy casual style gave me the excuse to wear one of my favorite wrap sweatshirts that I usually wear around the house but have never sported while I am out and about. I was afraid it would be to frumpy and sloppy. If you were to drop by unannounced at our house on any given day – you are likely to find me in this wrap and a pair of leggings. It is baggy, soft, and super comfy. It is one of those things that I love, but wasn’t sure if it was something that I could make presentable in public. 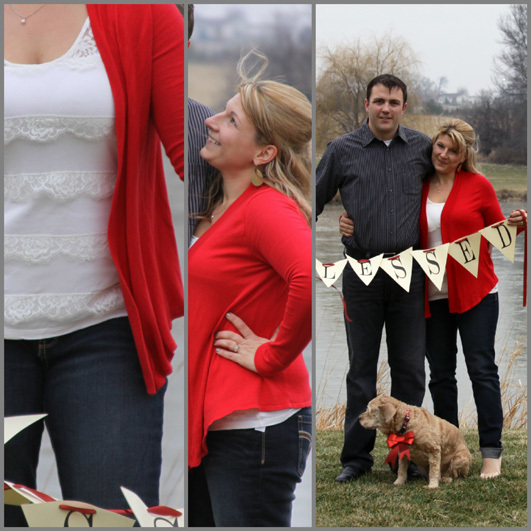 My inspiration photo gave me just what I needed to give it a try, and I think it is pretty presentable! Paired with a great pair of jeans, some shiny shoes, and a fun necklace it goes from frumpy to fun! Perfect for a comfortable and casual look! So, now time for the scarf. I sported my DIY ruffled scarf again this week, and got many compliments and questions about where I got it. Anyone I talked to was surprised that it was a simple DIY project. I first showed you this DIY scarf in a What I Wore Wednesday photo two weeks ago and… as I promised… here is the low down on how I made it! So fast, so easy, so cheap! Perfect for wearing with just about anything you like! I first spotted this scarf on Pinterest via The DIY Dish.com where they share a great DIY video. The process is very easy and requires no sewing at all! I used about a 1/4 to 1/2 of a yard of fabric (mine was a scrap piece left over from another project so I’m not sure of the exact dimensions). You could even use an old t-shirt or any jersey fabric. 2. Use a paper plate to trace as many circles as you can fit onto the fabric using chalk (I used an ice cream pail because I was out of paper plates). I would normally use white chalk, but used red so it would be visible in pictures for you. 4. Now take each circle individually and cut in about an inch. 5. Cut in a spiral pattern around the circle until you get into the center (refer to the picture above). 6. Pull the cut spiral straight through your hand and stretch it slightly. 8. Now wrap and wear it however you want! 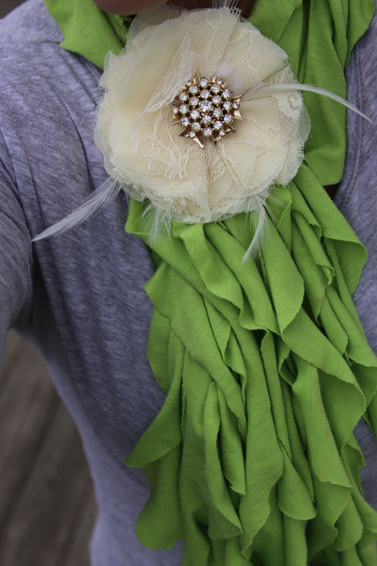 They look great embellished with a flower or broach! These would make a fabulous gift for anyone and the possibilities are endless! They would look beautiful in any color or pattern. We got all dressed up for some fun family photos for the Christmas card then off to holiday functions down town and a birthday party for a very special family member. Handsome hubby & Cute Dog: Priceless! 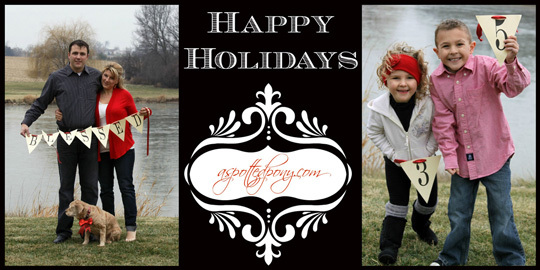 The pictures turned out exactly how I had hoped and I love the finished holiday greeting! Monday: Kids to school, running errands, and spending the night doing hair with family. LOVE all the pics! I SO wanna make that scarf BUT after reading it twice (and feeling like a total dope) I don’t think I can!! LOL! Your holiday photo’s are FAB!